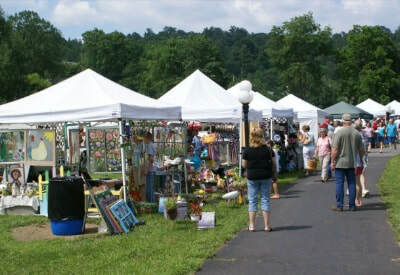 We invite all local & regional artists, craftspeople, food vendors, and other commercial vendors to apply for space at the NC Rhododendron Festival Craft Fair, held along the Creek Walk on Friday, June 15th, and Saturday, June 16th, 10am to 5pm. Applications for the Craft Fair are now available for download below. All food vendors must also fill out the Temporary Food Establishment Vendor Application (below) and return it to the Mitchell County Health Department. Non-profit food vendors are not required to remit the $75 food permit fee, but ARE required to submit the form. Please carefully read the rules, guidelines, and application instructions below (also contained within the application) before applying. Booth fees are due at the time of application. If your application is not accepted, your fee will be returned. All decisions by the Festival Committee as to which vendor application are accepted are final. We give preference to art & craft that is original and created solely by the displaying individual. Exhibitors must check in (with proper ID) at registration table by the pavilion before setting up. All exhibit spaces will be assigned. Exhibitors will be directed to their booth space on check-in. Exhibitors must staff booth at all times during festival hours. Booth sitters will be provided for short breaks as needed. Exhibit spaces accommodate 10'x10' tents ONLY. There are limited numbers of electric outlets. Please indicate any electricity requirement in the "Special Needs: field of the application. Every effort will be made to accommodate special requests for exhibit space assignments, but this cannot be guaranteed. Preference will be given to handicapped exhibitors and those with special needs (please indicate any requirement in the "Special Needs" field of the application. Parking for commercial vendors can be behind their assigned exhibit space. All other exhibitors will have parking available in public areas behind United Community Bank, and in the lot on Hemlock Drive, with exceptions made for handicapped vendors ONLY. No vehicles will be allowed on the grass in the pavilion area OR the asphalt walkway, even to unload, so please plan accordingly. Food vendors will have assigned spaces around the concrete pad - the only place in the pavilion area for onsite water and electrical connections, as required by Health Department regulations. Temporary Food permit application MUST be submitted. An accepted application is a commitment to show, and no refunds will be made for cancellation. Exhibitors who do not show will not be re-invited. No animals will be permitted in the immediate festival area. We love our furry friends, but health & safety regulations do not allow for their presences at the festival. Thanks for understanding! Exhibitors must provide their own means of display, and each exhibitor shall be responsible for his/her/ own display in case of damage or loss. Exhibits may be set up on Thursday afternoon between 4pm and 7pm (no earlier, or later) or on Friday between 6am and 9am. All exhibits must be completely set up by 9am Friday, and must remain in place until the show ends at 5pm. No tear-down before closing time - this is unfair to your fellow exhibitors. **Please note that as per N.C. Gen. Stat. § 66-255, everyone who sells tangible property at a festival is required to collect and remit NC state & county sales tax, and to have and display their Sales & Use Tax Certificate of Registration at their booth. Failure to comply with this statute is a Class 1 Misdemeanor offence and the individual can be charged as such. If you don’t have a number, registration is free and can be completed online at www.dornc.com/press/2012/nofee.html.